Hospitality security specialist and ASSA ABLOY Group member VingCard Elsafe, has provided a solution for the event staff at the Mobile World Congress held in Barcelona. The solution uses the Xperia T NFC handset to enable access to hotel rooms during the Congress. Using ASSA ABLOY’s Seos application, trial participants can check in at Hotel Porta Fira Santos, using their Sony handset upon which they will receive a digital room key straight to their handset using NFC. The digital key will be held securely in the Seos applet and stored in their G&D NFC SIM housed within the Xperia T.
The Seos ecosystem consists of interoperable electromechanical locks and readers, mobile phone apps, a secure digital key delivery mechanism and a Trusted Service Manager. These interconnected elements support the issuance, delivery and revocation of digital keys on NFC-enabled mobile devices that can be used to open doors to homes, hotels, offices, universities, hospitals or commercial buildings. 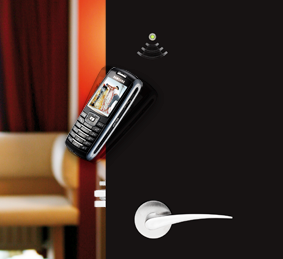 Trial participants at the Mobile World Congress simply touch their handset to Ving’s NFC-compatible Signature RFID electronic door lock to gain access to their room. The trial is a perfect match for the Hotel Porta Fira Santos, which is considered one of the most tech-savvy hotels in all of Barcelona.